Central Asian Buddhist monk teaching a Chinese monk. Bezeklik Caves, 9th-10th century; although Albert von Le Coq (1913) assumed the blue-eyed, red-haired monk was a Tocharian, modern scholarship has identified similar Caucasoid figures of the same cave temple (No. 9) as ethnic Sogdians, an Eastern Iranian people who inhabited Turfan as an ethnic minority community during the phases of Tang Chinese (7th-8th century) and Uyghur rule (9th-13th century). The Dharmaguptaka (Sanskrit; Chinese: 法藏部; pinyin: Fǎzàng bù) are one of the eighteen or twenty early Buddhist schools, depending on the source. They are said to have originated from another sect, the Mahīśāsakas. The Dharmaguptakas had a prominent role in early Central Asian and Chinese Buddhism, and their Prātimokṣa (monastic rules for bhikṣus and bhikṣuṇīs) are still in effect in East Asian countries to this day, including China, Vietnam, Korea, and Japan. They are one of three surviving Vinaya lineages, along with that of the Theravāda and the Mūlasarvāstivāda. Guptaka means "preserver" and dharma "law, justice, morality", and, most likely, the set of laws of Northern Buddhism. They say that although the Buddha is part of the Saṃgha, the fruits of giving to the Buddha are especially great, but not so for the Saṃgha. Making offerings to stūpas may result in many extensive benefits. The Buddha and those of the Two Vehicles, although they have one and the same liberation, have followed different noble paths. Those of outer paths (i.e. heretics) cannot obtain the five supernormal powers. The body of an arhat is without outflows. In many other ways, their views are similar to those of the Mahāsāṃghikas. According to the Abhidharma Mahāvibhāṣā Śāstra, the Dharmaguptakas held that the Four Noble Truths are to be observed simultaneously. Vasubandhu states that the Dharmaguptakas held, in agreement with Theravada and against Sarvāstivāda, that realization of the four noble truths happens all at once (ekābhisamaya). The Dharmaguptaka are known to have rejected the authority of the Sarvāstivāda prātimokṣa rules on the grounds that the original teachings of the Buddha had been lost. The Dharmaguptaka used a unique twelvefold division of the Buddhist teachings, which has been found in their Dīrgha Āgama, their Vinaya, and in some Mahāyāna sūtras. These twelve divisions are: sūtra, geya, vyākaraṇa, gāthā, udāna, nidāna, jātaka, itivṛttaka, vaipulya, adbhūtadharma, avadāna, and upadeśa. Between 148 and 170 CE, the Parthian monk An Shigao came to China and translated a work which described the color of monastic robes (Skt. kāṣāya) utilized in five major Indian Buddhist sects, called Da Biqiu Sanqian Weiyi (Chinese: 大比丘三千威儀). Another text translated at a later date, the Śāriputraparipṛcchā, contains a very similar passage with nearly the same information. However, the colors for Dharmaguptaka and Sarvāstivāda are reversed. In the earlier source, the Sarvāstivāda are described as wearing deep red robes, while the Dharmaguptaka are described as wearing black robes. The corresponding passage found in the later Śāriputraparipṛcchā, in contrast, portrays the Sarvāstivāda as wearing black robes and the Dharmaguptaka as wearing deep red robes. During the Tang dynasty, Chinese Buddhist monastics typically wore grayish-black robes and were even colloquially referred to as Zīyī (Chinese: 緇衣), "those of the black robes." However, the Song dynasty monk Zanning (919–1001 CE) writes that during the earlier Han-Wei period, the Chinese monks typically wore red robes. According to the Dharmaguptaka vinaya, the robes of monastics should be sewn out of no more than 18 pieces of cloth, and the cloth should be fairly heavy and coarse. The Gandharan Buddhist texts, the earliest Buddhist texts ever discovered, are apparently dedicated to the teachers of the Dharmaguptaka school. They tend to confirm a flourishing of the Dharmaguptaka school in northwestern India around the 1st century CE, with Gāndhārī as the canonical language, and this would explain the subsequent influence of the Dharmaguptakas in Central Asia and then northeastern Asia. According to Buddhist scholar A. K. Warder, the Dharmaguptaka originated in Aparānta. According to one scholar, the evidence afforded by the Gandharan Buddhist texts "suggest[s] that the Dharmaguptaka sect achieved early success under their Indo-Scythian supporters in Gandhāra, but that the sect subsequently declined with the rise of the Kuṣāṇa Empire (ca. mid-first to third century A.D.), which gave its patronage to the Sarvāstivāda sect." [T]he Khotan Dharmapada, some orthographical devices of Khotanese and the not yet systematically plotted Gāndhārī loan words in Khotanese betray indisputably that the first missions in Khotan included Dharmaguptakas and used a Kharoṣṭhī-written Gāndhārī. Now all other manuscripts from Khotan, and especially all manuscripts written in Khotanese, belong to the Mahāyāna, are written in the Brāhmī script, and were translated from Sanskrit. In the 7th century CE, Xuanzang and Yijing both recorded that the Dharmaguptakas were located in Oḍḍiyāna and Central Asia, but not in the Indian subcontinent. Yijing grouped the Mahīśāsaka, Dharmaguptaka, and Kāśyapīya together as sub-sects of the Sarvāstivāda, and stated that these three were not prevalent in the "five parts of India," but were located in the some parts of Oḍḍiyāna, Khotan, and Kucha. It was the Dharmaguptakas who were the first Buddhists to establish themselves in Central Asia. They appear to have carried out a vast circling movement along the trade routes from Aparānta north-west into Iran and at the same time into Oḍḍiyāna (the Suvastu valley, north of Gandhāra, which became one of their main centres). After establishing themselves as far west as Parthia they followed the "silk route", the east-west axis of Asia, eastwards across Central Asia and on into China, where they effectively established Buddhism in the second and third centuries A.D. The Mahīśāsakas and Kāśyapīyas appear to have followed them across Asia into China. [...] For the earlier period of Chinese Buddhism it was the Dharmaguptakas who constituted the main and most influential school, and even later their Vinaya remained the basis of the discipline there. Between 250 and 255 CE, the Dharmaguptaka ordination lineage was established in China when Indian monks were invited to help with ordination in China. No full Vinaya had been translated at this time, and only two texts were available: the Dharmaguptaka Karmavācanā for ordination, and the Mahāsāṃghika Prātimokṣa for regulating the life of monks. After the translation of full Vinayas, the Dharmaguptaka ordination lineage was followed by most monks, but temples often regulated monastic life with other Vinaya texts, such as those of the Mahāsāṃghika, the Mahīśāsaka, or the Sarvāstivāda. In the 7th century, Yijing wrote that in eastern China, most people followed the Dharmaguptaka Vinaya, while the Mahāsāṃghika Vinaya was used in earlier times in Guanzhong (the region around Chang'an), and that the Sarvāstivāda Vinaya was prominent in the Yangtze area and further south. In the 7th century, the existence of multiple Vinaya lineages throughout China was criticized by prominent Vinaya masters such as Yijing and Dao An (654–717). In the early 8th century, Dao An gained the support of Emperor Zhongzong of Tang and an imperial edict was issued that the sangha in China should use only the Dharmaguptaka vinaya for ordination. The Gandhāran Buddhist texts (the oldest extant Buddhist manuscripts) are attributed to the Dharmaguptaka sect by Richard Salomon, the leading scholar in the field, and the British Library scrolls "represent a random but reasonably representative fraction of what was probably a much larger set of texts preserved in the library of a monastery of the Dharmaguptaka sect in Nagarāhāra." Among the Dharmaguptaka Gandhāran Buddhist texts in the Schøyen Collection, is a fragment in the Kharoṣṭhī script referencing the Six Pāramitās, a central practice for bodhisattvas in Mahāyāna doctrine. In the early 5th century CE, Dharmaguptaka Vinaya was translated into Chinese by the Dharmaguptaka monk Buddhayaśas (佛陀耶舍) of Kashmir. For this translation, Buddhayaśas recited the Dharmaguptaka Vinaya entirely from memory, rather than reading it from a written manuscript. After its translation, the Dharmaguptaka Vinaya became the predominant vinaya in Chinese Buddhist monasticism. The Dharmaguptaka Vinaya, or monastic rules, are still followed today in China, Vietnam and Korea, and its lineage for the ordination of monks and nuns has survived uninterrupted to this day. The name of the Dharmaguptaka Vinaya in the East Asian tradition is the "Vinaya in Four Parts" (Chinese: 四分律; pinyin: Sìfēn Lǜ), and the equivalent Sanskrit title would be Caturvargika Vinaya. Ordination under the Dharmaguptaka Vinaya only relates to monastic vows and lineage (Vinaya), and does not conflict with the actual Buddhist teachings that one follows (Dharma). The Dīrgha Āgama ("Long Discourses," 長阿含經 Cháng Āhán Jīng) (T. 1) corresponds to the Dīgha Nikāya of the Theravada school. A complete version of the Dīrgha Āgama of the Dharmaguptaka sect was translated by Buddhayaśas and Zhu Fonian (竺佛念) in the Later Qin dynasty, dated to 413 CE. It contains 30 sūtras in contrast to the 34 suttas of the Theravadin Dīgha Nikāya. The Ekottara Āgama ("Incremental Discourses," 增壹阿含經 Zēngyī Āhán Jīng) (T. 125) corresponds to the Anguttara Nikāya of the Theravāda school. It was translated into Chinese by Dharmanandi in 384 CE, and edited by Gautama Saṃghadeva in 398 CE. Some have proposed that the original text for this translation came from the Sarvāstivādins or the Mahāsāṃghikas. However, according to A.K. Warder, the Ekottara Āgama references 250 prātimokṣa rules for monks, which agrees only with the Dharmaguptaka Vinaya. He also views some of the doctrine as contradicting tenets of the Mahāsāṃghika school, and states that they agree with Dharmaguptaka views currently known. He therefore concludes that the extant Ekottara Āgama is that of the Dharmaguptakas. The Dharmaguptaka Tripiṭaka is said to have contained two extra sections that were not included by some other schools. These included a Bodhisattva Piṭaka and a Mantra Piṭaka (咒藏 Zhòu Zàng), also sometimes called a Dhāraṇī Piṭaka. According to the fifth-century Dharmaguptaka monk Buddhayaśas, the translator of the Dharmaguptaka Vinaya into Chinese, the Dharmaguptaka school had assimilated the "Mahāyāna Tripiṭaka" (大乘三藏 Dàchéng Sānzàng). The Dharmaguptaka biography of the Buddha is the most exhaustive of all classical biographies of the Buddha, and is entitled Abhiniṣkramaṇa Sūtra. Various Chinese translations of this text date from between the 3rd and 6th century CE. It is unknown when some members of the Dharmaguptaka school began to accept the Mahāyāna sūtras, but the Mañjuśrīmūlakalpa records that Kaniṣka (127-151 CE) of the Kuṣāṇa Empire presided over the establishment of Prajñāpāramitā doctrines in the northwest of India. Tāranātha wrote that in this region, 500 bodhisattvas attended the council at Jālandhra monastery during the time of Kaniṣka, suggesting some institutional strength for Mahāyāna in the northwest during this period. Edward Conze goes further to say that Prajñāpāramitā had great success in the northwest during the Kuṣāṇa period, and may have been the "fortress and hearth" of early Mahāyāna, but not its origin, which he associates with the Mahāsāṃghika branch. ... [T]he overall picture that the Ugra presents is quite clear. 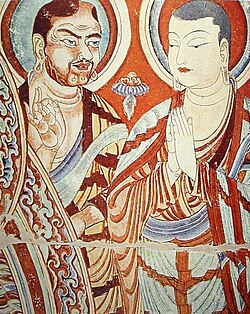 It describes a monastic community in which scriptures concerning the bodhisattva path were accepted as legitimate canonical texts (and their memorization a viable monastic specialty), but in which only a certain subset of monks were involved in the practices associated with the Bodhisattva Vehicle. The Mahāyāna Ratnarāśivyākaraṇa Sūtra, which is part of the Mahāratnakūṭa Sūtra, is believed by some scholars to have a Dharmaguptaka origin or background, due to its specific regulations regarding giving to the Buddha and giving to the Saṃgha. According to Joseph Walser, there is evidence that the Pañcaviṃśatisāhasrikā Prajñāpāramitā Sūtra (25,000 lines) and the Śatasāhasrikā Prajñāpāramitā Sūtra (100,000 lines) have a connection with the Dharmaguptaka sect, while the Aṣṭasāhasrikā Prajñāpāramitā Sūtra (8000 lines) does not. Instead, Guang Xing assesses the view of the Buddha given in the Aṣṭasāhasrikā Prajñāpāramitā Sūtra (8000 lines) as being that of the Mahāsāṃghikas. The translator Buddhayaśas was a Dharmaguptaka monk who was known to be a Mahāyānist, and he is recorded as having learned both Hīnayāna and Mahāyāna treatises. He translated the Dharmaguptaka Vinaya, the Dīrgha Āgama, and Mahāyāna texts including the Ākāśagarbha Bodhisattva Sūtra (虛空藏菩薩經 Xūkōngzàng Púsà Jīng). The preface written by Buddhayaśas for his translation of the Dharmaguptaka Vinaya states that the Dharmaguptakas had assimilated the Mahāyāna Tripiṭaka. In the 4th century Mahāyāna abhidharma work Abhidharmasamuccaya, Asaṅga refers to the collection which contains the Āgamas as the Śrāvakapiṭaka, and associates it with the śrāvakas and pratyekabuddhas. Asaṅga classifies the Mahāyāna sūtras as belonging to the Bodhisattvapiṭaka, which is designated as the collection of teachings for bodhisattvas. Paramārtha, a 6th-century CE Indian monk from Ujjain, unequivocally associates the Dharmaguptaka school with the Mahāyāna, and portrays the Dharmaguptakas as being perhaps the closest to a straightforward Mahāyāna sect. ^ Bhikkhu Sujato, Sects and Sectarianism, p. 131. ^ a b c d Heirman, Ann; Bumbacher, Stephan Peter, eds. (2007). The spread of Buddhism. Leiden: Brill. ISBN 978-9004158306. ^ Presenters: Patrick Cabouat and Alain Moreau (2004). "Eurasia Episode III - Gandhara, the Renaissance of Buddhism". Eurasia. Episode 3. 11:20 minutes in. France 5 / NHK / Point du Jour International. ^ Sujato Bhikkhu. "About the EA". ekottara.googlepages.com. Retrieved on 2013-02-11. Heirmann, Ann (2002). Rules for Nuns According to the Dharmaguptakavinaya. Motilal Barnasidass, Delhi. ISBN 81-208-1800-8. Ven. Bhikshuni Wu Yin (2001). Choosing Simplicity. Snow Lion Publications. ISBN 1-55939-155-3.